Before I drone on about this fab chicken gyro salad, I wanted to thank all of you who commented, both here and on Instagram, and emailed over the past few weeks to send your thoughts, prayers, and condolences about my dad. (This post will fill you in if you’re unsure what I’m talking about.) Writing about dad last weekend was incredibly difficult and your kind and heartfelt words helped to lift me up. You guys really are the best and I thank you endlessly for your love and support. And so this chicken gyro salad: it’s pretty hard not to love. Prep is simple with a super basic yet insanely flavorful Greek-inspired marinade for the chicken and a few chopped up veggies. You can buy the tzatziki cucumber-yogurt dipping sauce in most grocery stores these days or easily make your own (recipe is below but I’ve made and loved this one in the past too), especially if you’re burdened with a seemingly endless supply of garden cucumbers. And as much as I love to bake my own bread stuffs, I bought some whole wheat pita to go with this salad. Pita isn’t something I like to tackle on a weeknight after work so I bend my own rules to make dinners like this one work when I’m short on time. This was another meal I made when Kyle’s business partner was over a few weeks ago and I wish I were kidding when I say that there were virtually no leftovers, save some tzatziki and feta. The three of us completely devoured almost everything you see here: one and a half pounds of grilled chicken thighs, four (I think?) whole pita, a pint of cherry tomatoes, a head of romaine, two cucumbers, and almost half a red onion. And can you blame us? I’m making it again tonight when my mom is up to visit and I can barely contain my excitement!! Chicken gyro salad is pretty hard not to love! Prep is simple with a basic yet insanely flavorful Greek-inspired marinade and some chopped up veggies. Served family style, it's a build-your-own dinner the whole family will love! To make the marinade: Combine all of the ingredients in a gallon-size zip-top bag and smush them around until the chicken is well-coated. Refrigerate for anywhere between 2 and 24 hours. When ready to cook, preheat the grill to medium-high and cook the chicken, discarding the leftover marinade, for 4-5 minutes per side until cooked through. Let cool for 5 minutes then chop or slice into pieces. To make the tzatziki: Shred the cucumber using the shredding attachment of a food processor or on the large-holed side of a box grater. Wring the shredded cucumber in a clean kitchen towel until just about no liquid remains. Mix the shredded cucumber and all of the remaining ingredients in a bowl. Refrigerate until ready to use. 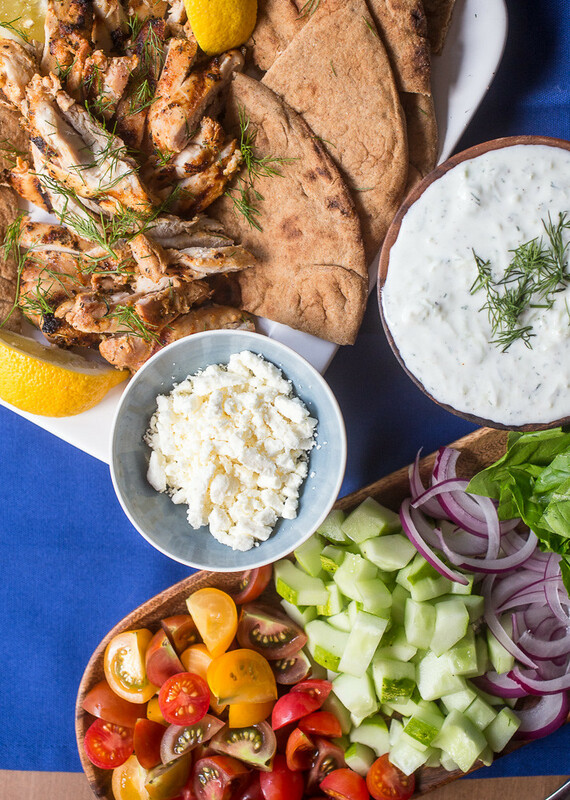 *The garlic will bloom in flavor the longer it sits before serving so you may want to cut back a little if you're planning to make the tzatziki in advance. 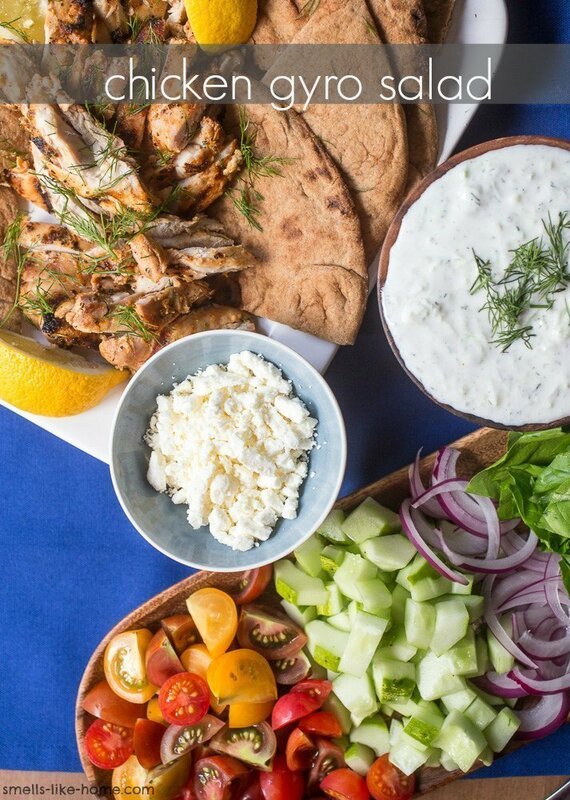 To serve: Lay the lettuce, onion, tomatoes, chopped cucumber, feta, pitas, and chicken out on large platters or in serving bowls. 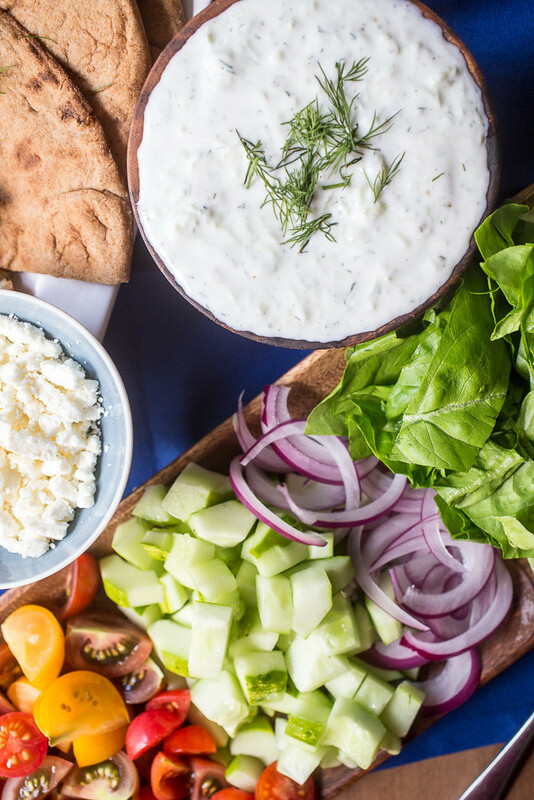 Assemble salads with desired toppings with tzatziki drizzled over the top. Any leftovers will keep for a day or two, tops, in the fridge; tzatziki will last about 4-5 days; feta will last a couple of weeks. This salad was crazy awesome!!! The marinade. The sauce. Oh. My. Word. The marinade for the chicken is going to be showing up on my summer grilled chicken! Awesome girl!!! Oh yeah! 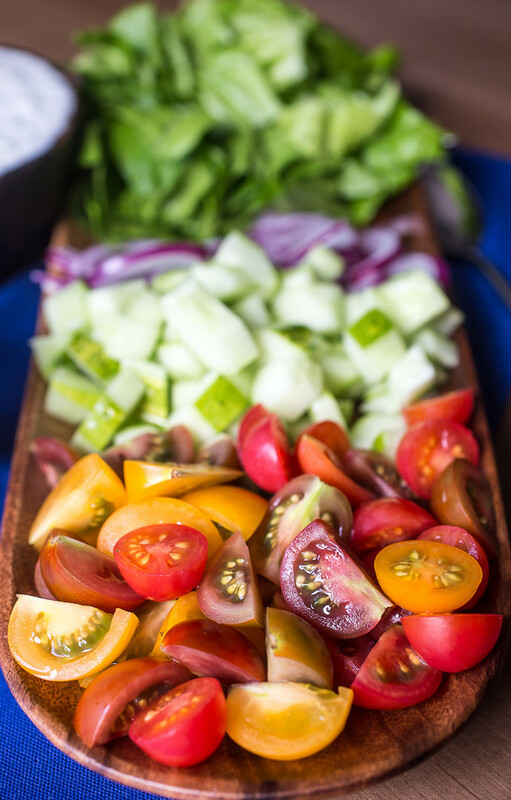 This is seriously one of our most favorite salads ever and I knew for sure it would be a hit with you guys too! 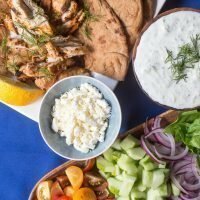 The marinated chicken and the tzatziki sauce are the big stars here (I could seriously drink the tzatziki!)! This was aaamazing! The chicken marinade alone was incredible. This will be making several appearances on our table this summer! Thanks for sharing such a great recipe. Your recipes never disappoint. Love the new look of the blog too!